The rain in Peoria, Illinois didn’t stop the women’s golf team from having a successful weekend. The team placed fourth out of 11 teams at the Bradley Invitational in Peoria, held Saturday and Sunday at the WeaverRidge Golf Club. USD’s senior Brenna Lervick finished in a tie for second place, shooting one-under par with 71 in the first round, 72 in the second and 73 in the third. Junior Abby Dufrane tied for 11th. Dufrane was one of three golfers at the tournament to record an eagle. The women played on a wet field, as Peoria accumulated some three inches of rain over four days prior. Dufrane said she thinks the rain helped. After the first day, USD was seventh, and then moved up to fourth on Sunday. Dufrane said the move boosted the confidence of the team. Bradley took the team title at 19-over par with 883 strokes and was also the only team to shoot under 290 for a round. Drake was the runner up with 909 strokes, followed by Missouri-St. Louis. USD came in third at 50-over par. 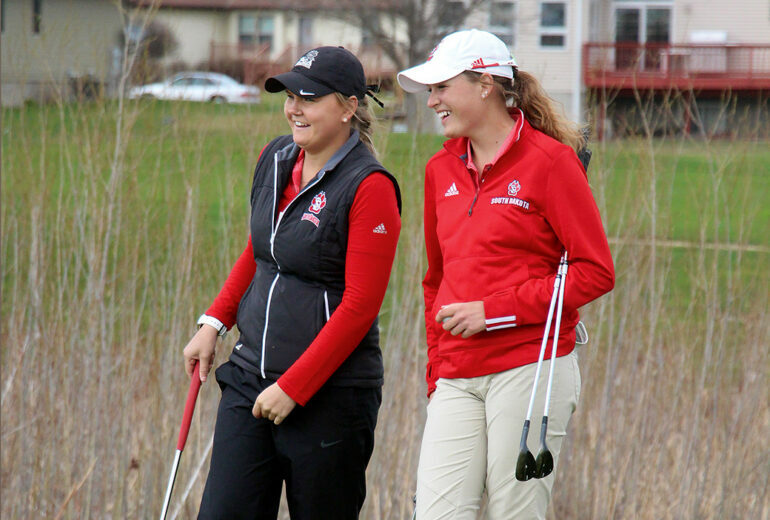 USD defeated their Summit League opponent Western Illinois by four strokes. The Coyotes will be in Kansas on Sunday to play in the UMKC Kansas City Shoot Out. Clay is a junior at USD majoring in both journalism and political science.